One final honorary tribute to one who lived as an unsung hero. In the off-chance you really haven’t heard the news yet, our dear friend Mr. Iwata, the President of Nintendo, has passed away from a cancerous bile-duct growth, at the age of 55. We in the gaming world talk very frequently about the likes of the Shigeru Miyamoto, Hideo Kojima, Tetsuya Nomura, Masahiro Sakurai, Keiji Inafune, etc., praising them each for their genius (read: craziness) in terms of character or game design, etc. Each of them is the “father” of some beloved franchise, and we consider them to be akin to legendary heroes of some sort. But this man, Mr. Satoru Iwata, he’s a little bit different. You see, Iwata-san isn’t really the sole “creator,” of any of these big name franchises we all know and love. He didn’t make Kirby, that was Sakurai. He didn’t make Pokémon, or Zelda, or anything. But he was nonetheless there. He helped make those games. Those legendary figures might have come up with the ideas, the names, places, and characters, but its the programmers, the grunt force, like Mr. Iwata, who bring those ideas to life. Early on in his years he and coworker Masahiro Sakurai tag-teamed to create the original Kirby, Kirby’s Dreamland for the GameBoy, and he even helped with the programming on Mother2/Earthbound at Creatures Inc. Thanks to his programming prowess, he almost single-handedly saved Pokémon Gold & Silver, Pokémon Stadium, and Super Smash Bros. Melee with his last-minute mad-dash bugfixing superpowers. He oversaw the release of every title released for the GameCube, and was integral to pushing forward the Nintendo DS. And it was his voice and his action and decision-making that saw the Wii become one of the single-most successful consoles of all time. So not only was he this savant programmer that proved his worth through his unparalleled work-ethic and genius, but he was also extraordinarily responsible and humble. During one of Nintendo’s lowest points in recent years, when they were in a bit of a financial decline, rather than firing the lowest common denominators, Iwata-san cut his own paycheck in half. What other CEO would cut their own checks in times of trouble like that? Ever? Not any that I can think of, that’s for sure. So let’s take a moment together, shall we? Stay awhile, and listen. I’ve found a number of tributes and stories from various sources across the internet, and I’d like to share them with you. Some are second-hand tales, others are more personal, and all are in memory of El Presidenté de Nintendo himself, Mr. Satoru Iwata. To provide a little insight into this amazing individual, I present an excerpt from “Iwata Asks.” For those who don’t know, Iwata Asks is a series of interviews conducted by Nintendo Global President Satoru Iwata with key creators behind the making of Nintendo games and hardware. Legendary figures such as Mario creator Shigeru Miyamoto are often involved in these in-depth discussions. The excerpt: Today I Learned that when it was time to make Pokemon Stadium, future Nintendo President Satoru Iwata got a hold of the PKMN Red/Green source code, and figured out how all the battle logic worked so it could be ported. The original programmer was astounded he figured out the complicated system - in just a week. Iwata: For this Iwata Asks interview I am joined by Tsunekazu Ishihara-san, President and CEO of The Pokémon Company, and Shigeki Morimoto-san from Game Freak. Thank you both for coming today. If you’re interested in reading more from these interviews, the entire series of Iwata Asks is still up on Nintendo’s website. The man was an incredible programmer. Originally, Pokemon Gold/Silver couldn’t even fit on the 2MB GBC cartridge. He compressed the data so much that not only was Gamefreak able to fit the whole game on it, there was so much leftover space that they decided to add the whole Kanto region. Not only that - he’s the sole person responsible for Super Smash Bros Melee being released on time. The Melee team wasn’t going to finish it fast enough and Iwata sat down with the programmers, reviewed, tested and fixed all of the code in the game, all over the course of 3 weeks every single day. He wasn’t even familiar with the coding IIRC, he learned to fix it. He’s literally a programming prodigy. He’s also the reason we have more Smash games. Originally, Sakurai was gonna port Melee to the Wii but Iwata said no and basically made the rest of the smash games happened. EDIT: Remembered wrong. He announced Brawl WITHOUT telling Sakurai and basically told him we’ll either port Melee with WiFi to the Wii or you make Brawl. He had so much faith in Sakurai that he basically said we can’t make a new Smash game without him. If you’re a baby from 95-2000, there’s a major chance you’ve heard of the Gamecube. Iwata oversaw every single release during that era, took Nintendo’s failure with the Gamecube (It wasn’t #1, surprising, right? ), and made the Wii the number 1 console of its generation. Iwata is literally the embodiment of my freaking childhood. I love this man and what he has done. Oh yeah, he also HALVED HIS PAY RECENTLY TO HELP WITH THE WII U’S FAILURE. HALVED HIS CEO PAY. VERY few would do that. Iwata’s Wii U was also a winner in my eyes - Xbone and PS4 stood for good graphics and stories, but the Wii U? The Wii U stood for fun. FUN. RIP Iwata - Thank you for all the memories. May your successor dream of accomplishing the things you did. This is sad. 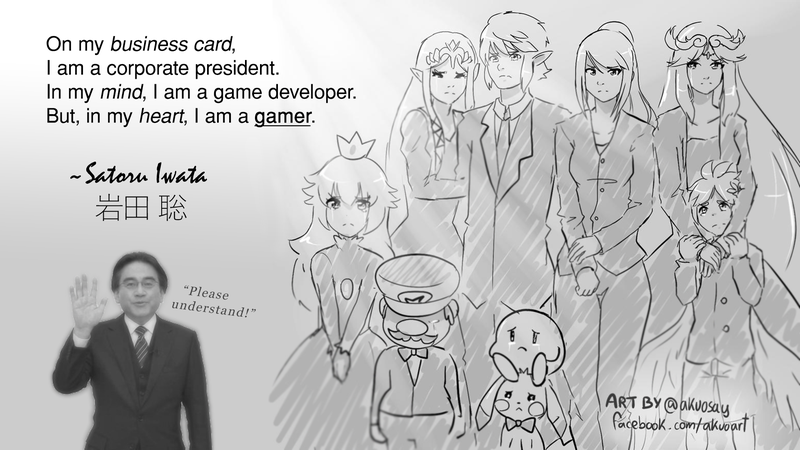 I worked at Nintendo while Iwata-san was president. While some of the investors may have been unhappy with his decisions for the company, the employees respected and loved him a lot. Unlike previous presidents he was personally a lover of video games, and had worked on many games himself as a software engineer. There aren’t a lot of game companies whose president is a software engineer him/herself and I was proud of that fact. I saw him up close once, when he came to NOA for an event promoting Wii Sports internally. He jogged in the room to some energy-infused music (might’ve been the Rocky theme? ), pumping his fists high in the air along with the Wii Remote and nunchuk that he held. He got up in front of everyone and boxed against Reggie (the NOA president—I think he had just recently been appointed to the position) in Wii Boxing while a jam-packed room of employees cheered him on. I don’t remember the exact outcome, but I think Iwata-san won best 2 out of 3. He was a genuine, fun, and nice guy, and Nintendo will be hard-pressed to find another leader like him. Iwata and what he did at Nintendo will change my life forever. When I was a small child and my parents where going through a divorce all I had with me was my Wii. I hardly had any friends because I was a Nintendo gamer and I was often very sad. But, when I put in a disc whole new world opened up to me that I never imagined existed. Things got worse for me years later when I became depressed about being assaulted by my father and went to court rooms every week for my right to stay away from him. What made me last through those dark days was my Nintendo DS and all the games that I played. Now being older and looking back on my life, if it was not for Nintendo and Iwata my life may have been much darker. I could have turned to drugs and drinks but instead Nintendo let me turn to them. Thank you Iwata for turning me into the person I am today, and thank you for inspiring millions of kids around the world. Stay fresh and please understand. May you inspire and play in peace. He won’t be providing Directly To You anymore. But he Showed us his Moves. Admittedly, he made mistakes. Like how many people were disappointed at E3 2015. However, nobody in this world is perfect, we all make mistakes. And what’s even sadder, is that he left saying that he apologizef for what happened at E3. He wanted to listen to his fans after that day. And he left us with Super Mario Maker, so that we could make our own games, and dreams. Heck, even Sony acknowledged him! And they’re business rivals! I’m buying that game just so I can have a little momento from him. And if you’re like me, you would probably do the same. Now if you’ll excuse me, I have some Majora’s Mask 3D to play. “Please Understand.” See you, Space GameBoy. Satoru Iwata’s passing is the first time I have ever felt upset about any sort of ‘celebrity’ death. This hit me 10x harder than Leonard Nemoy, Christopher Lee, and Robin Williams combined. So... we finally understood, but at what cost? It took the death of a great game developer to understand what we could not perceive before. Let us not take for granted the gifts he has left behind. May he rest in peace. In situations like this, people tend to talk as if they knew him personally. It always feels weird and, to a degree, disingenuous. In this case however, he had such a personality on the screen during Nintendo Direct, and he always seemed so true to himself; it really does feel like we all knew him for real. A unique man that was a part of some great games and their legacy, and a great company. A kind man that took a huge pay cut to help the company he loves. A humble man that tried to be as open as a CEO can be to his fans. A passionate man that cared for his work and the work of his company. I can’t claim to know him personally, but I know all of that is true. I most remember Mr. Iwata from his famous Directs.... I always loved watching him. He was so active in the industry and company that he was passionate about..... I’ll never forget the face of Nintendo Direct and the subject of those memes. Rest in peace, Iwata-san. You brought touched and brought joy to so many people, including me. We won’t forget what you’ve done. This is the kind of news that makes you realize how important it is to cherish the ones you love and take the time to appreciate the ones that make your life better, whether they’re an immediate part of it or not. Iwata-san was a man I didn’t realize I cared so much for until he was suddenly taken from us. And looking back on his history and how much he meant to my life as a fan of Nintendo games... I respect and care for the man now more than ever. It’s so amazing to see the internet come together and embrace what a genuinely good human being he was with no cynicism whatsoever. It’s such a perfect reflection of his character and how he brought so much joy wherever he went - and to think that came from a corporate executive... That’s amazing. I can’t think of a single person in his position that has ever conveyed that sense of humility, kindness and fun-loving silliness. To know that we’ve suddenly lost that...hurts. It hurts. I don’t know who will replace Iwata-san, but I can only hope it’s someone who understands what it takes to run a company like Nintendo: someone who understands the meaning of fun and how to bring it to the lives of others. Rest in peace, my friend. Thank you for your contributions to this industry and thank you for being the man you were. GameXplain made this beautiful, sincere tribute to Iwata-san. It brought me to tears. In these last few hours I’ve seen dozens of heartwarming stories like these, tales of Mr. Iwata’s genuine kindness and enthusiasm. His goofy broken English and hilariously meme-tastic and bizarre Nintendo Directs were a mad stroke of comedy and marketing genius. No one put on a show quite like Iwata-san did. Nintendo Directs simply will not be the same without him. Nintendo... no, the world.. will not be the same. On only a few rare occasions has there ever been a natural-born genius who was able to truly reach their full potential. To not just be a really good programmer, or problem solver, or what have you, but to be able to constantly push through one’s own circumstances, to apply oneself and grow and learn and be proven worthy of greatness. Satoru Iwata was just a simple programming nerd, a nerd who loved video games, like all of us. He loved games so much that he wanted nothing more than to share the fun he had playing games with others. So he dedicated his life to not only creating games, but eventually to sharing the games he loved with millions of people all around the world. He pushed himself beyond being just a lowly programmer and took on the mantle of chief. Openly he embraced the challenge of leadership and responsibility. Miyamoto-san’s always been a dreamer, with his head in the clouds, and Sakurai’s always the tunnel-vision work-a-holic. Someone had to step up to the plate. Mr. Satoru Iwata was one of the most influential, generous, and brilliant, benevolent men this world has ever had the privilege of knowing. He lived a full, happy life, and I hope he knows that, in his final moments, he was loved by millions of people all around the world.